RCMP, with support from the BC Wildfire Service, are continuing their investigation into a series of wildfires believed to have been deliberately set in the Okanagan Valley in the past four years. 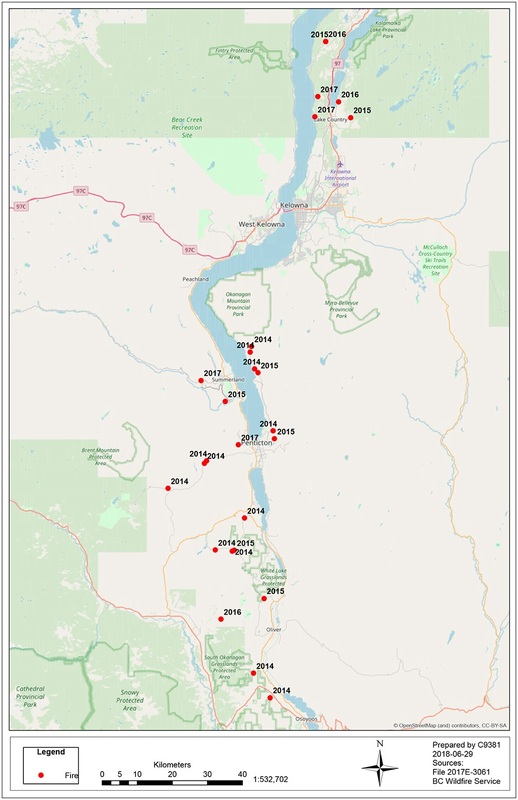 In this time period, there were 29 wildfires reported in Naramata, Okanagan Falls, Osoyoos, Oliver, Penticton, Summerland and Lake Country (Map of fire locations). Evidence gathered during the course of the investigations into these fires have led investigators to believe they are connected and that the cause was determined to be arson. In May 2018, the Southeast District RCMP Intentionally Set Wildfires Task Force was created in an effort to further the investigation into these wildfires and identify the person(s) responsible. Members of the task force are working in partnership with the BC Wildfire Service and other impacted stakeholders. The Task Force has the ability to focus on all related historical and future wildfires, regardless of jurisdictional and inter-agency boundaries, which have been caused by arson. The majority of these fires were lit in interface settings, says S/Sgt. Annie Linteau, BC RCMP. One of these fires, which occurred on July 15, 2017, in Lake Country, destroyed a number of homes. Thankfully, no one was injured or killed but the potential for the loss of life was considerable.